Expand your workspace with the Cameo hutch. Instantly adding more shelving and concealed storage to your workspace as well as creating an interesting feature for your office. 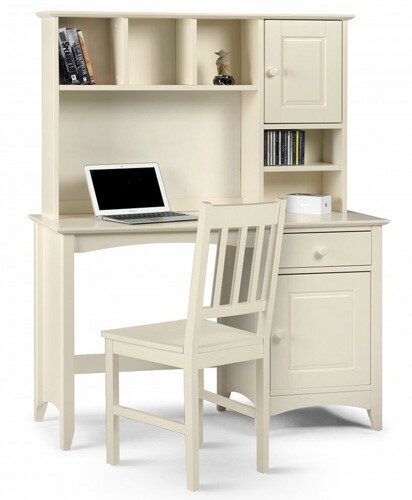 The Cameo hutch is an ideal solution for expanding your work space and adding some extra storage space. The hutch sits perfectly on top of the Cameo desk and adds four shelves and a cupboard for some concealed storage. Introducing the Cameo hutch to your desk creates a more intimate work space which you can easily style and decorate to your liking, thanks to the versatile design and neutral finish of the hutch. Constructed from MDF the Cameo hutch is strong and sturdy. Finished in an off white, smooth lacquer, enhancing the durability of the hutch. Simply wipe over with a duster or dry cloth to maintain a pristine finish. For tougher marks try a warm damp cloth before resorting to chemical cleaners. The Cameo hutch is delivered flat pack and self-assembly will be required. The instructions are simple and easy to follow. Assembly can be managed by one person for this item. When fitting your hutch to your Cameo desk always lift and place carefully. 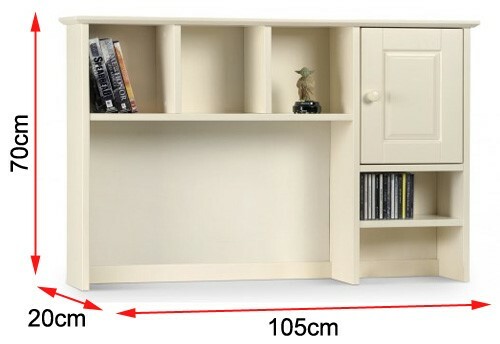 Do not push the hutch when fitting, to avoid damaging the surface of your Cameo desk. Question from Susan Robinson: Asked on 28/08/2017 do you do bookcases to match the hutch top in stone white?